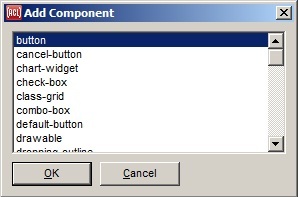 This dialog is displayed by the Form | Add Component menu command, when a form is selected. The dialog allows adding a component to the form. A component is a control or a non-visible object with programmatic effect. (Controls are always visible.) Only controls are supported at this time, so this dialog allows adding controls to a form. Selecting a control and clicking OK places an instance of that control on the form.